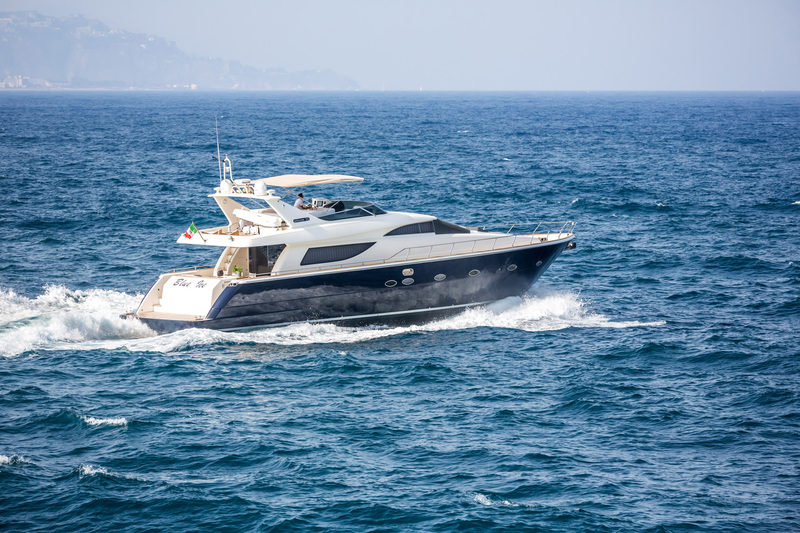 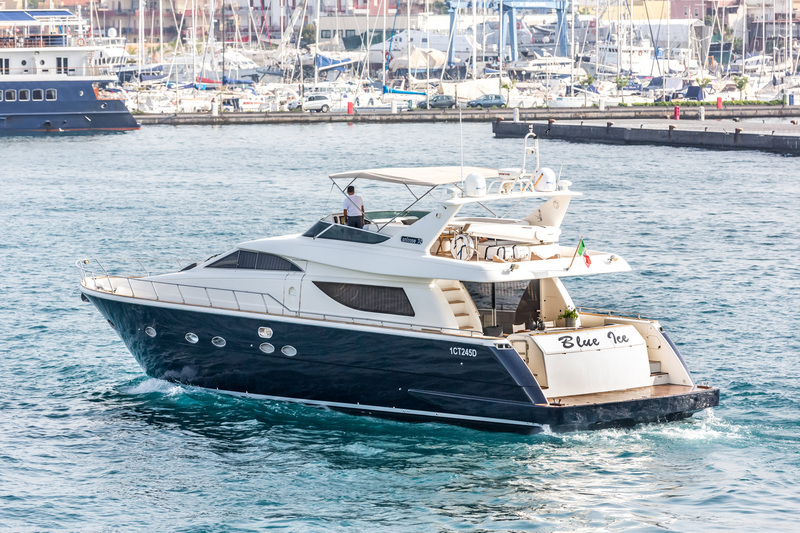 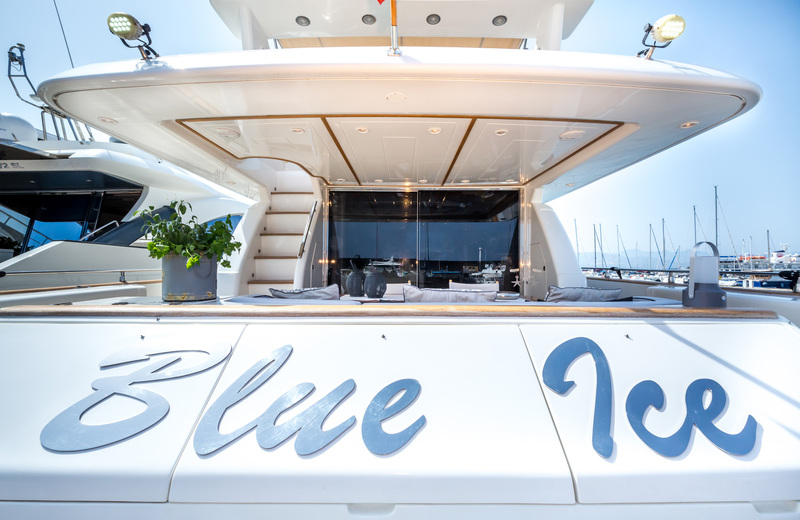 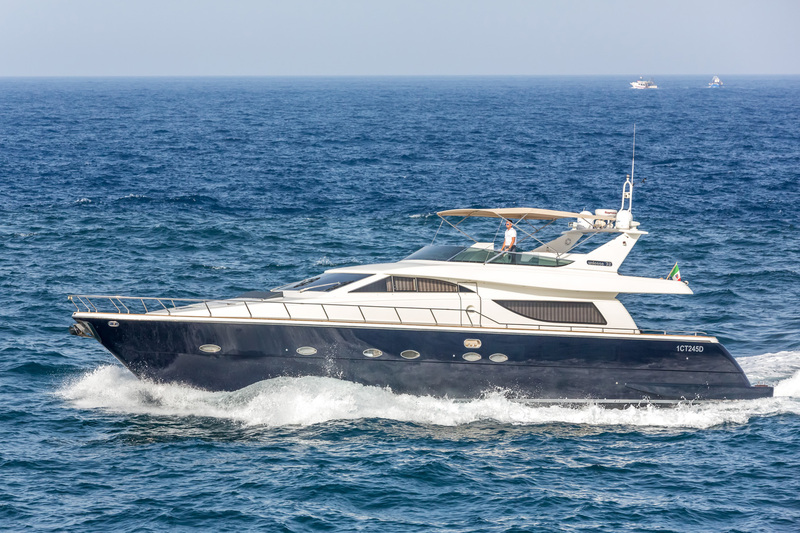 BLUE ICE is a 22.44 metres (73' 7") luxury motor yacht, available for crewed charter vacations and built by the Italian shipyard Uniesse Marine in 2002. 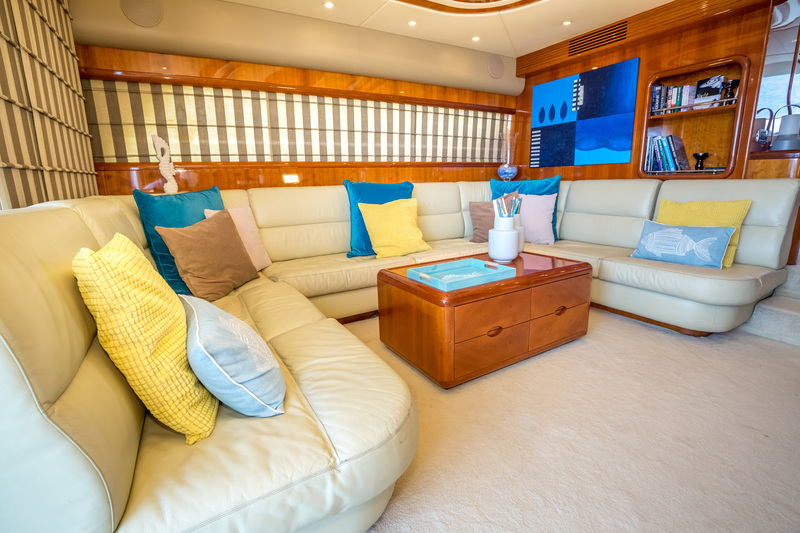 Refitted in 2016, she has a professional crew of three on board and offers accommodation for up to eight guests in four cabins. 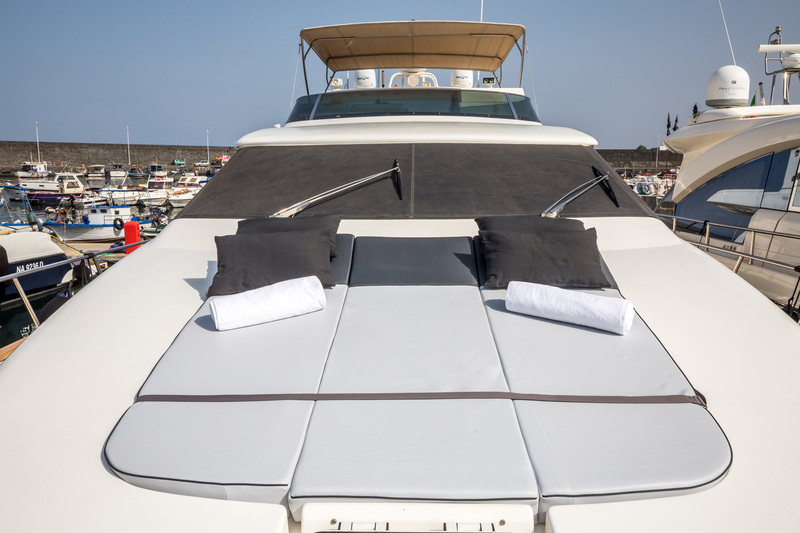 The lower deck provides a deep swim platform for spreading out with the water toys and sunbathing beside the water. 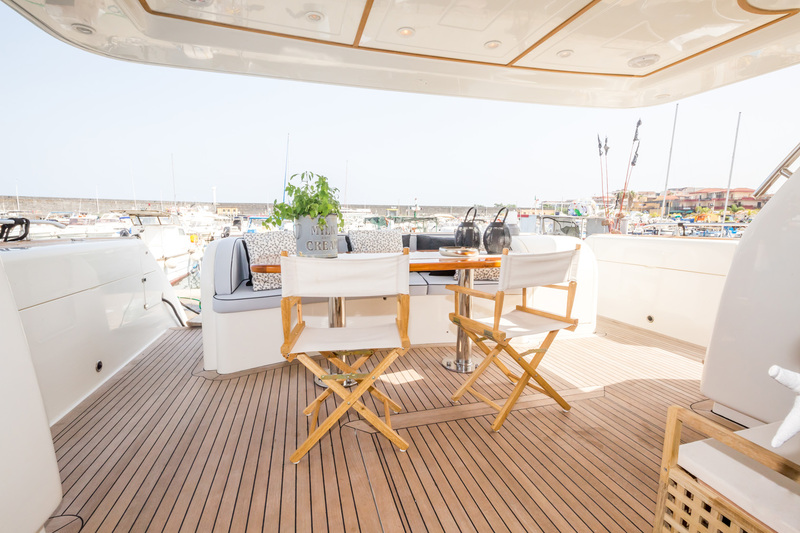 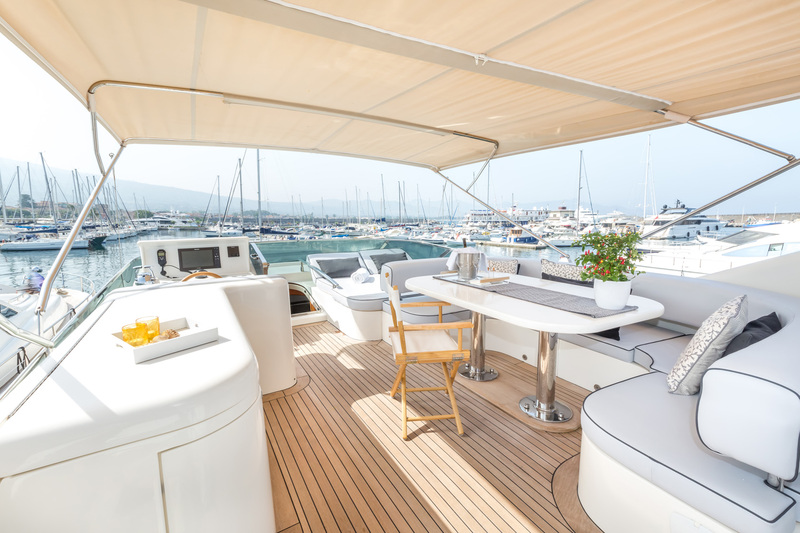 Two staircases connect up to the main deck aft, where there is a sofa integrated into the stern and an elevated table for alfresco dining in the fresh air. 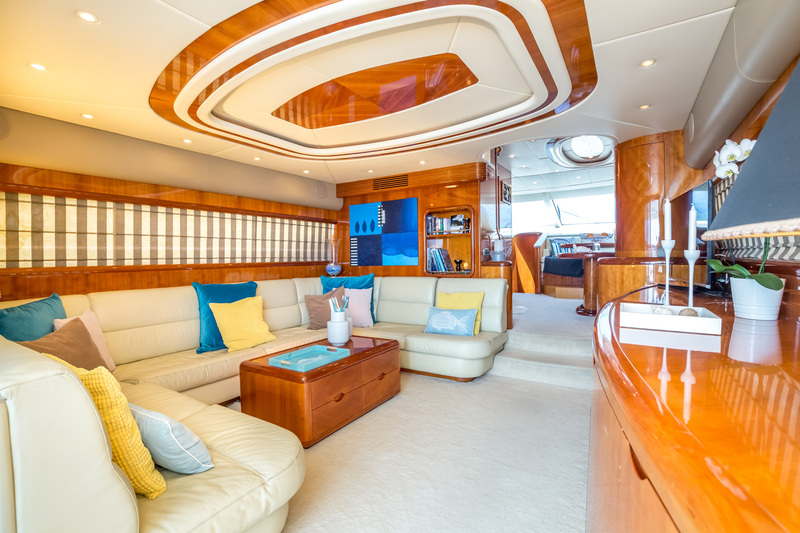 A walkways leads around to the foredeck and a broad sunbed covered the area in front of the helm station for sweeping views. 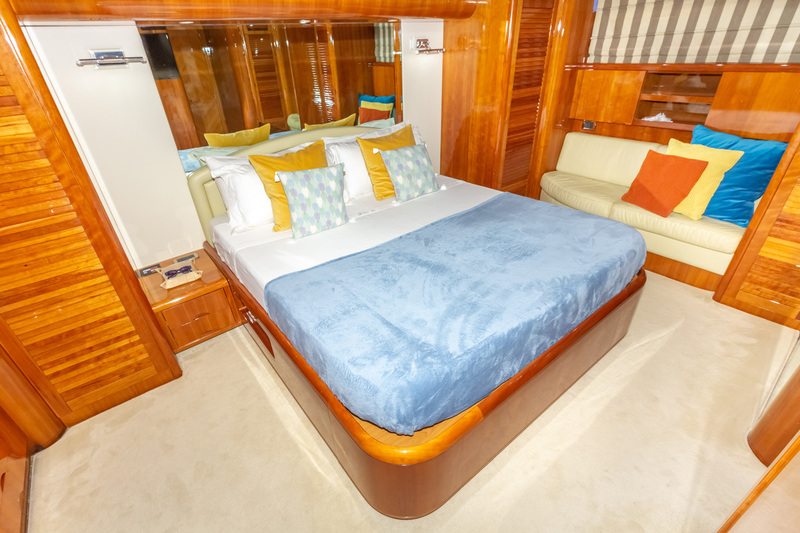 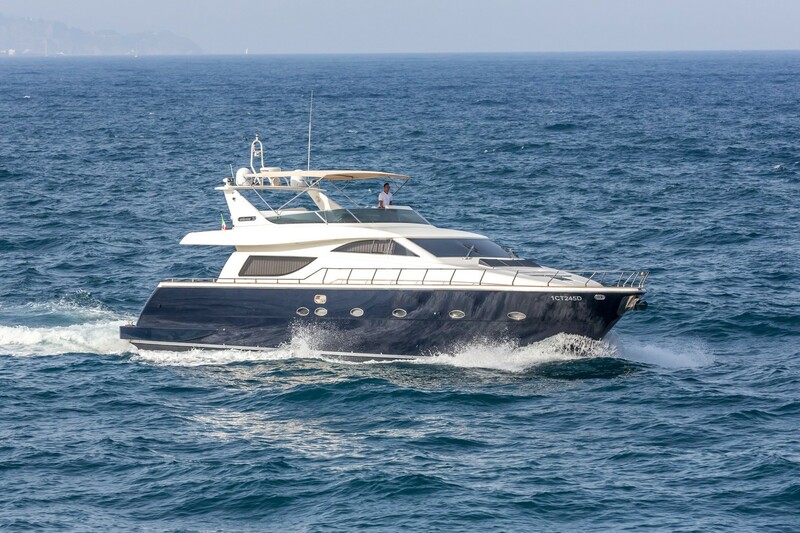 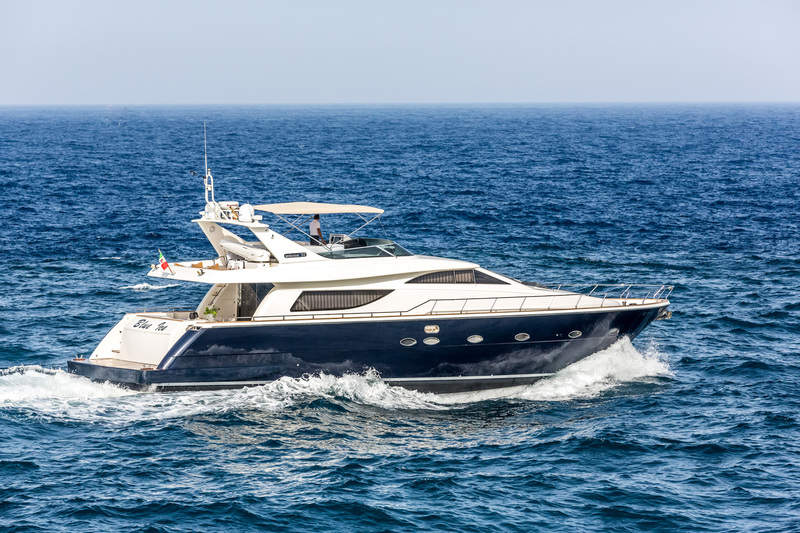 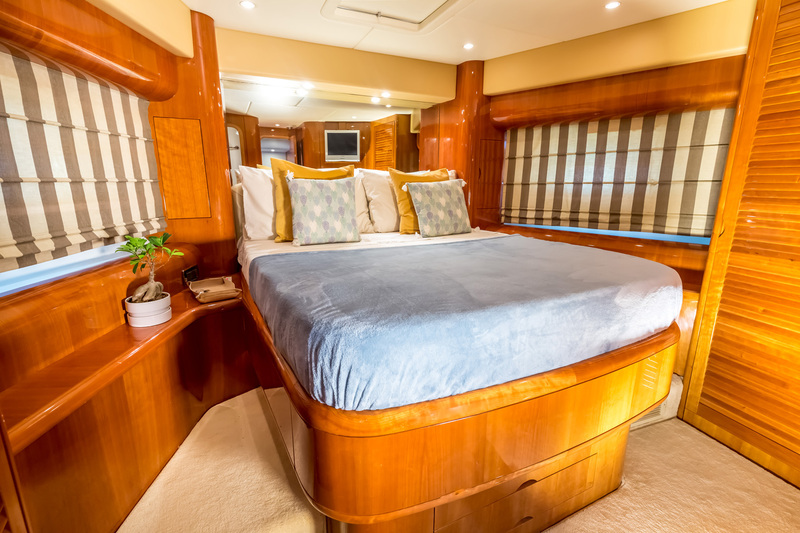 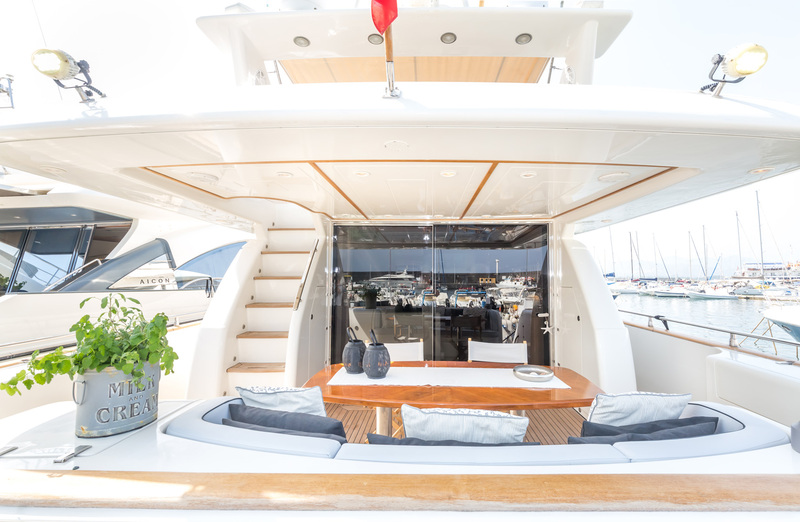 Above, the flybridge hosts a sumptuous sunbed starboard of the helm station, and immediately behind, beneath the central hardtop a shaded alfresco dining area provides a comfortable place for guests to rest and take in the views. 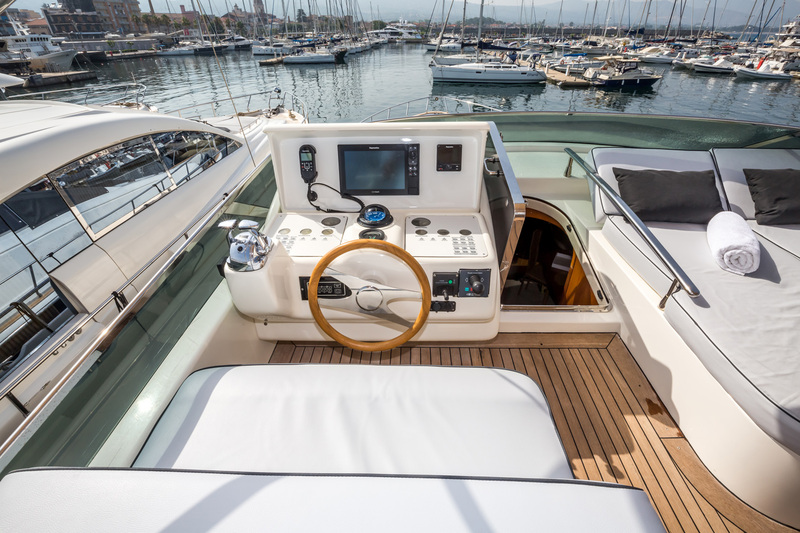 Along the stern, there is room to store a tender, which can be launched and retrieved using a Davit crane. 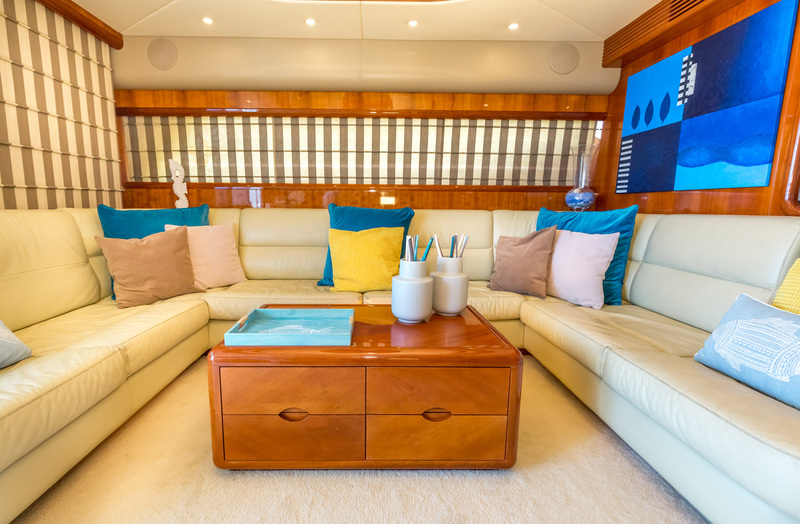 The interior decor uses timeless warm wood panelling and cream furnishing coupled with pale blue and orange-gold accents for comfortable and welcoming interior spaces. 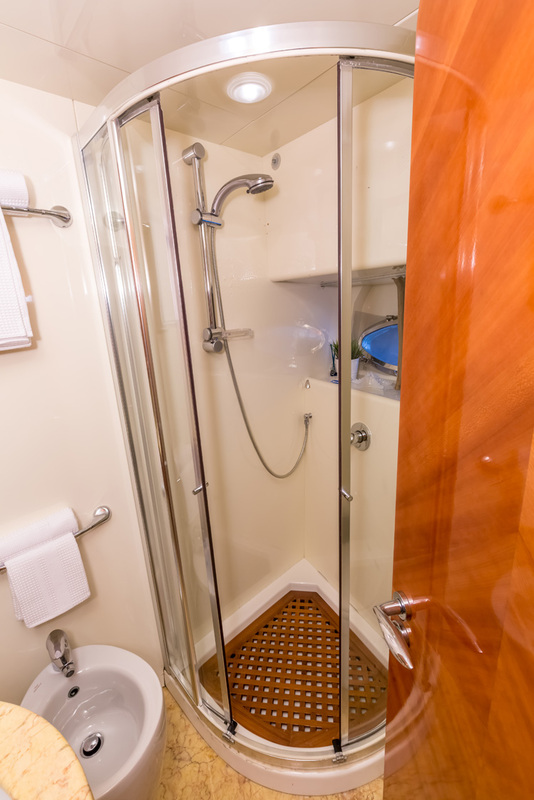 The lower deck hosts the guest and crew accommodation, which is separated by the engine room. 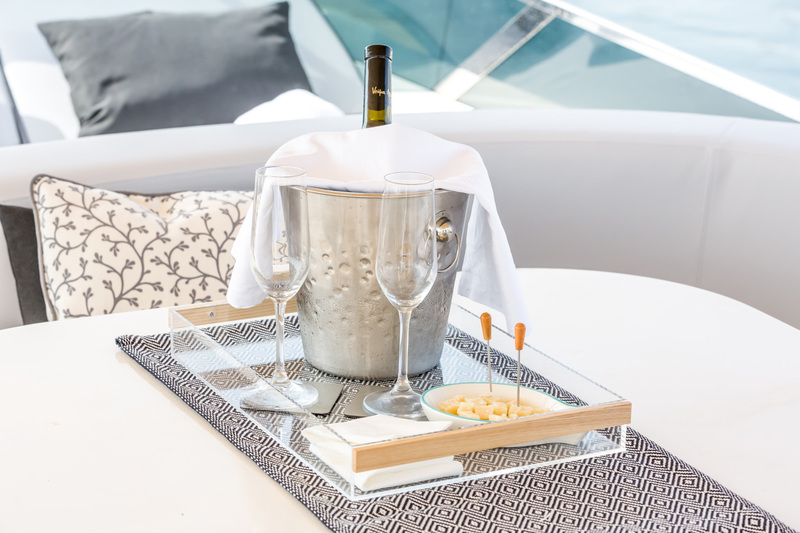 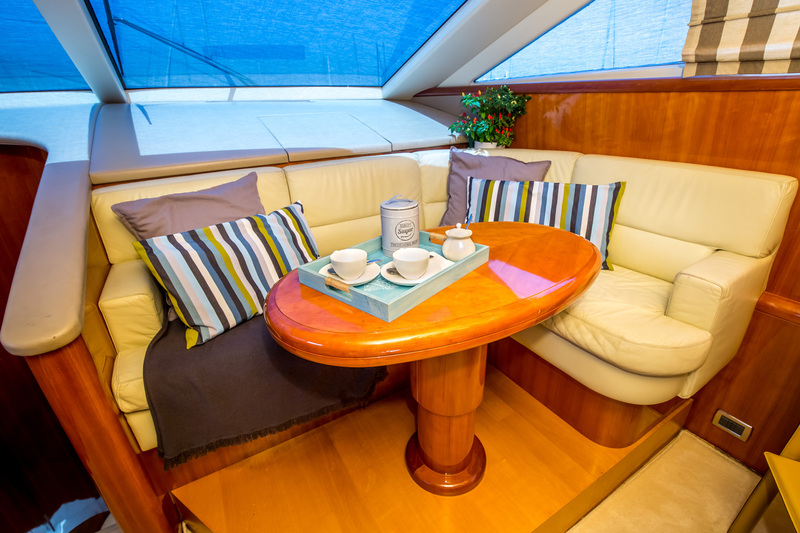 On the main deck, the helm station is placed forward and port with a corner sofa and table opposite creating a casual social environment enjoying plenty of light. 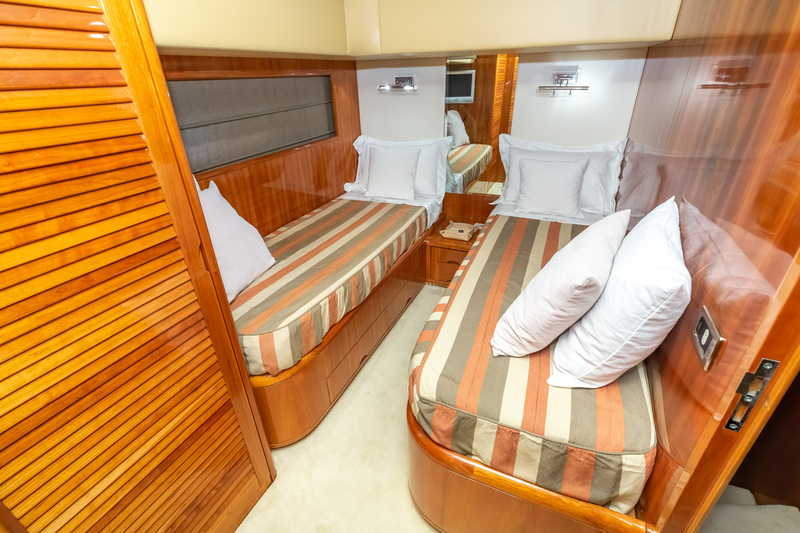 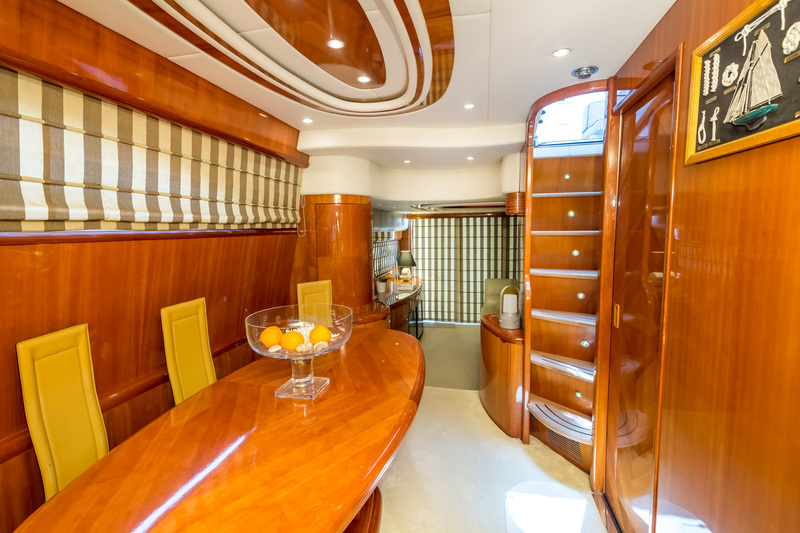 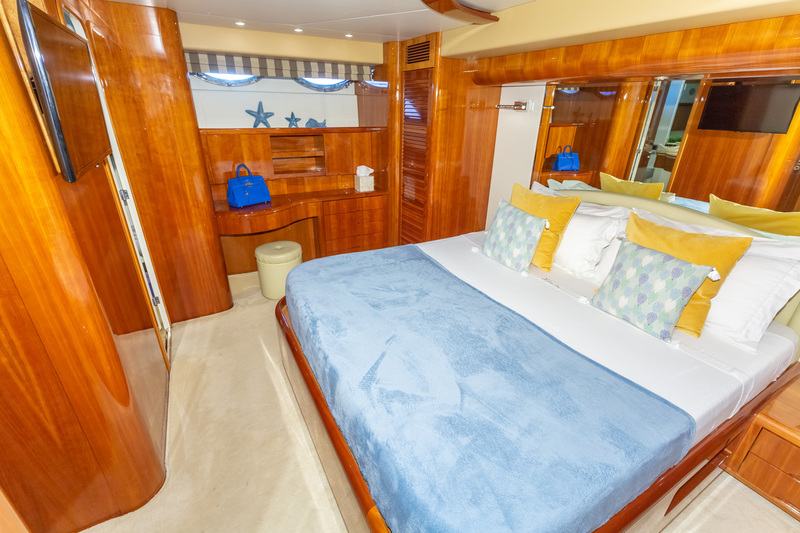 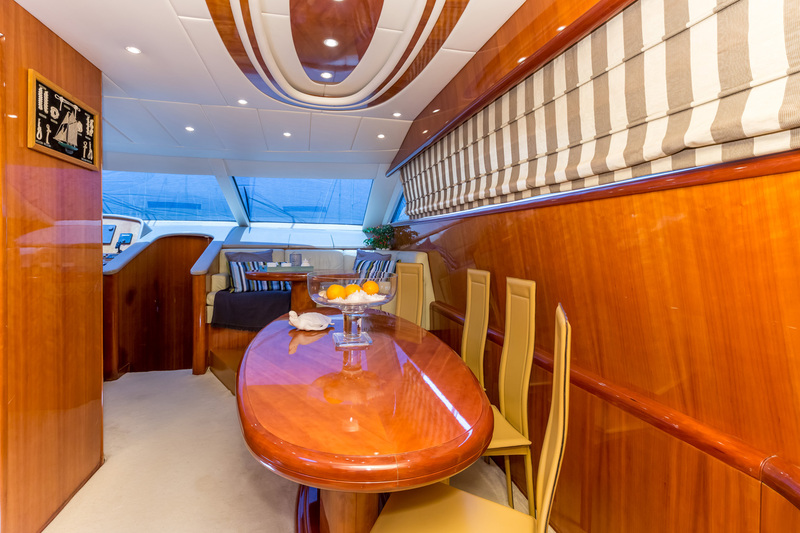 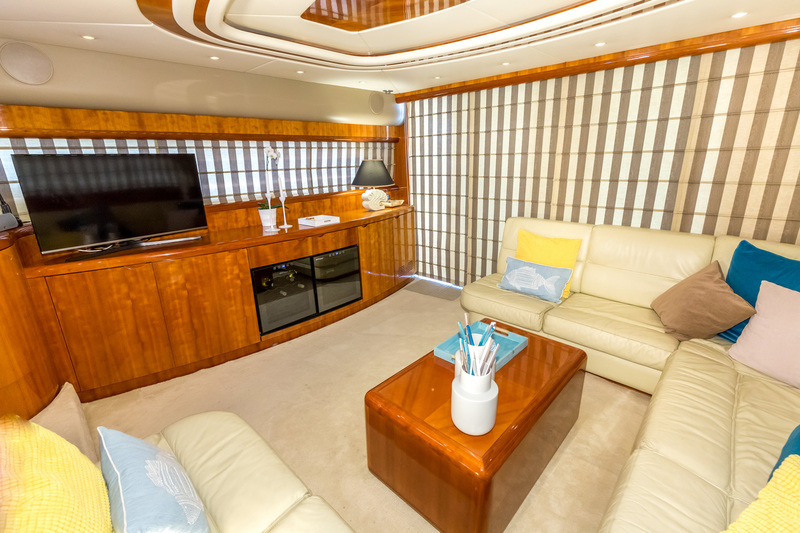 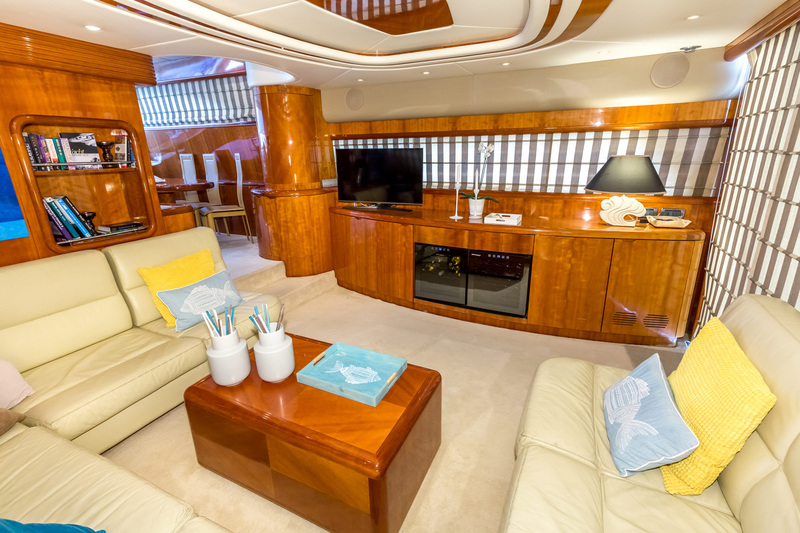 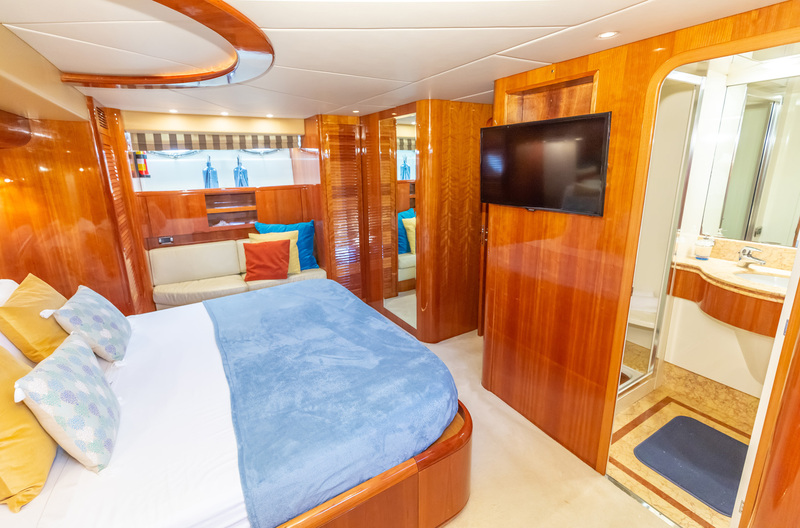 Down the starboard side, guests will find the formal dining area, able to seat up to eight guests with the galley to port, and the corridor leads through to the large aft lounge where sofas line three sides of the interior to create a U-shaped seating area around a central coffee table. 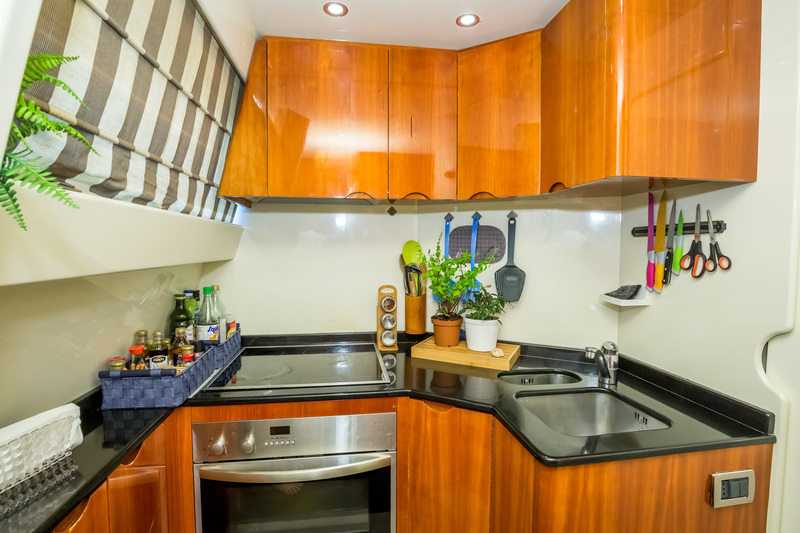 Opposite a 40" widescreen TV sits on top of a cabinet, within which there is a wine chiller. 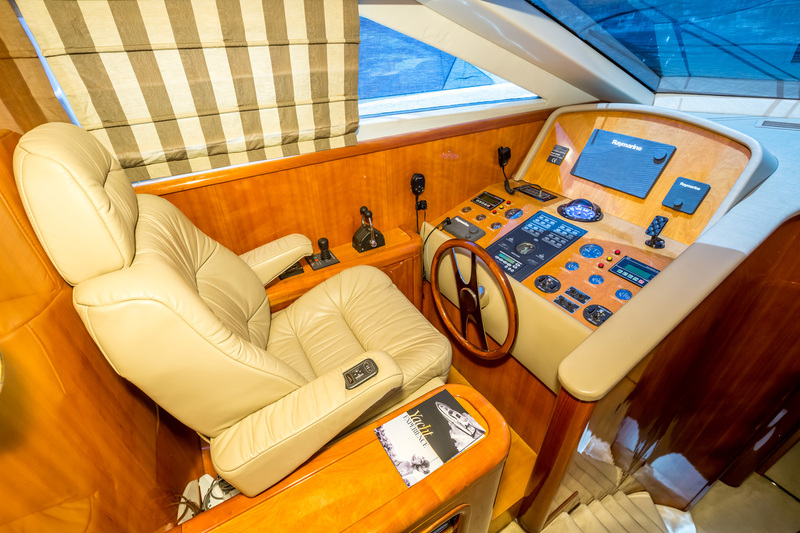 A pair of MAN engines producing 1,224 HP ensures a maximum speed of 24 knots and a cruising speed of 18 knots. 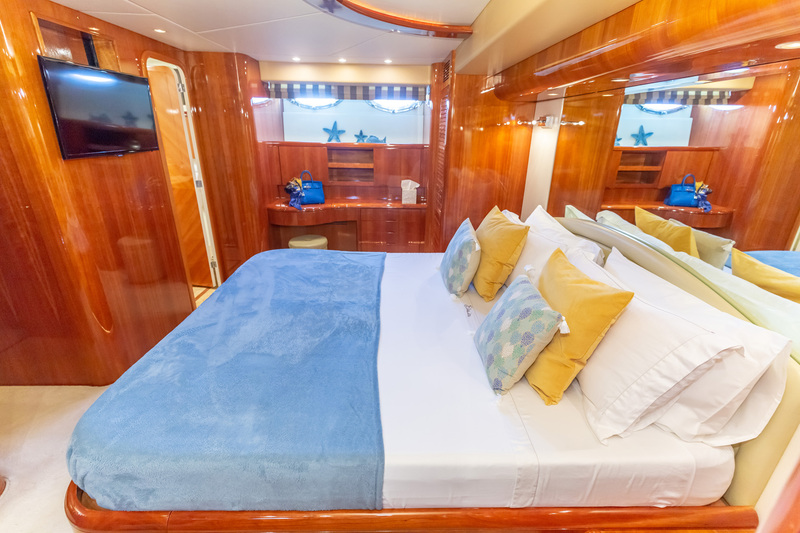 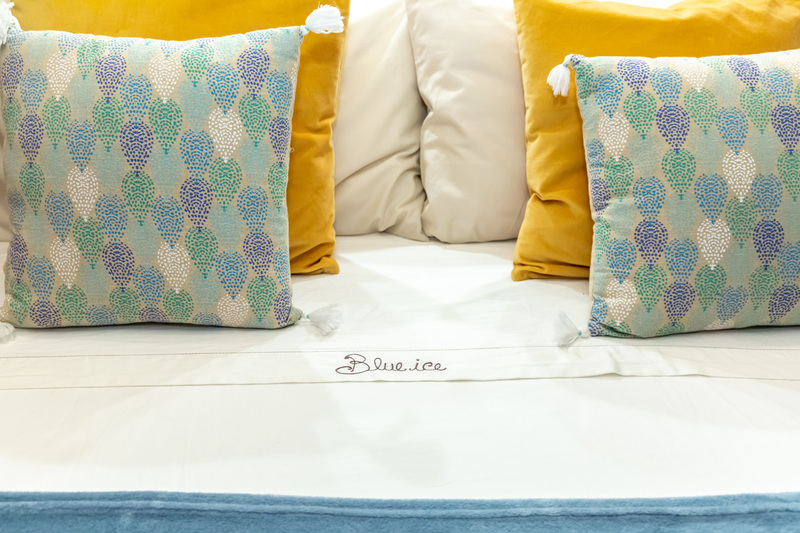 Accommodation includes four guests cabins sleeping up to eight guests. 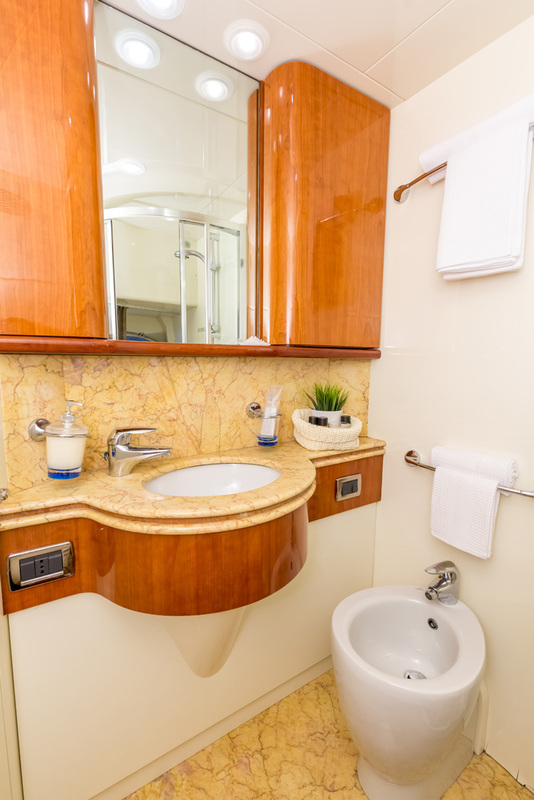 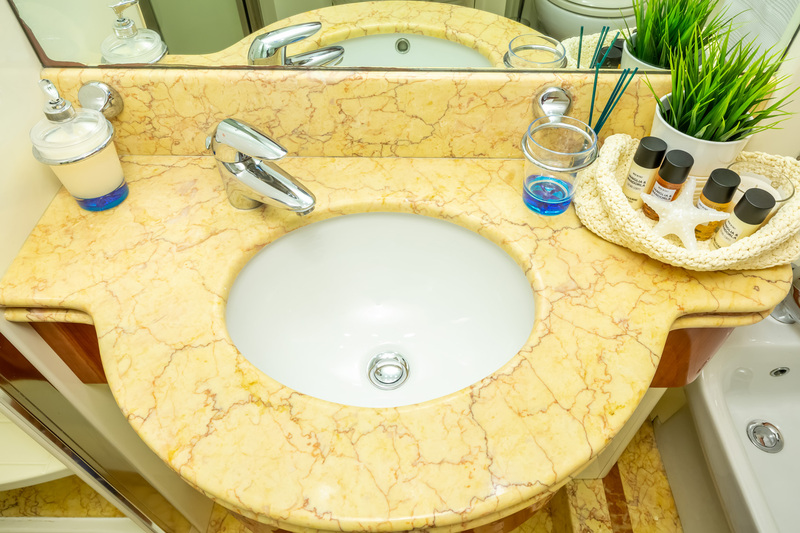 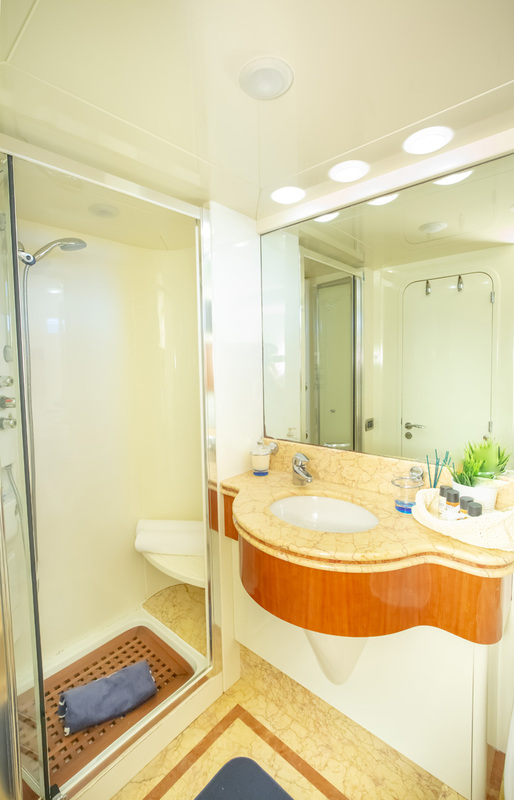 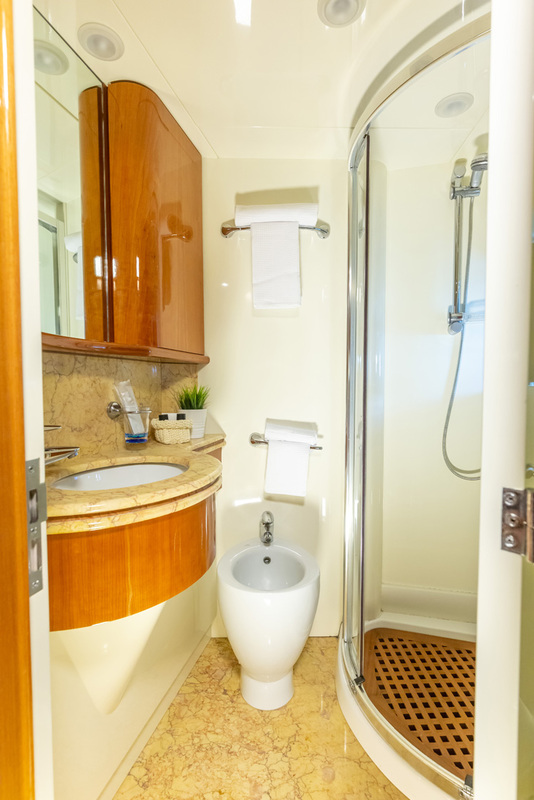 One master suite, one VIP suite and two twin cabins offer deluxe overnight stay, all including private ensuite bathroom facilities.